Conflict Management | Free eBooks Download - EBOOKEE! 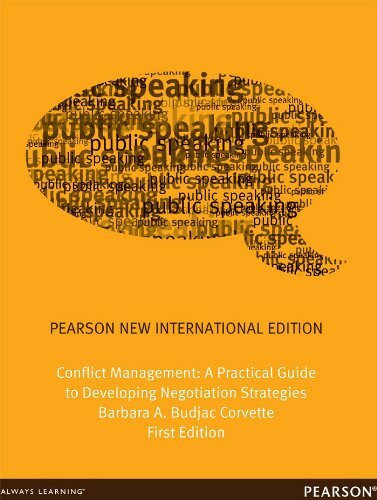 Conflict Management: A Practical Guide to Developing Negotiation Strategies by Barbara A. Budjac Corvette Ph.D. Appropriate Courses: Conflict Management and Negotiation. Becoming an effective negotiator is a universal skill that can benefit all. Unlike other books, Conflict Management explores how to develop this universal skill, using a very individual, personalized approach. Grounded in theory and research, it examines the psychological and sociological factors inherent in the negotiation process. It explores the complexities of negotiations, by looking at how conflict is related and how temperaments and personality traits impact the process. Filled with exercises, self-assessment tools, examples, and cases, the book links theory to practice and gives readers an opportunity to develop, practice, and perfect their own unique set of negotiation skills. No comments for "Conflict Management".